Recently, there have been a lot of discussion around a new role in the enterprise, something akin to “Chief Digital Officer” and many have suggested that this creates the need to establish “Bi-Modal IT” in effect a new parallel organization that reflects agile development against a new technology basis. Based upon some core research from the LEF‘s David Moschella, Digital Leadership (DL) is really just the transformation of traditional Leadership, and is required from the boardroom down in order to create a competitive company. DL is not a role, but an operating model within those firms. We think that having engaged and technically savvy CxO’s, Double Deep “Vertical | Technology | Process” Employees, an Outside-In Execution Model, as well as an ecosystem strategy are really more important qualities than organization (who is going to be CDO or front vs. back-office IT). If you agree that having the right operating model is more important than organization please read on, as I believe that the digital organization really needs to be grounded in Continuous Transformation and Transformation. Instead of focusing on organizational strategies for DL, clients need to think substantially about the key transformations that they are trying to achieve and the skills and communities that enable digital value to be realized. In my experience, all C ompanies are really looking at an evolutionary value chain. In this value-chain, companies can depict bringing new innovation into the firm, but also around a set of core functions that are “table stake” requirements driven by vertical industry and regulation. Over the last decade+, new “as a Service” players have entered the market enabling companies to replace functions that used to be viewed as core, with basic highly standardized commodity services – utilities. These utilities are highly evolved, to operate against a homogeneous target and derive efficiency from their focus. Whether we want to talk about Power Generation, Inter-networking, or Infrastructure as a Service (IaaS) the ability to contest [find a multitude of providers against] a standard set of requirements has been key to the value proposition. But, to fully exploit this proposition, many clients are forced to substantially change their own requirements. In most case,s the enterprise must change things like contracts (SLAs, warranties) and specific customization requirements; to materialize the benefits of ?aaS. In many clients, the move to mainframe & open-system teams and standard enterprise architecture capabilities was a step toward this, as were Labs teams that operated to bring innovation to the firm. But we know that the standardization efforts within large firms typically fell far short of their “single purpose” competitors in the open market. In the past, we have seen BPaaS providers like SalesForce.com, Google Analytics and Workday make substantial progress at standardizing several key processes, but this year we’ve really seen a push toward “Hybrid Cloud” and “Hybrid Workplace” as core IT looks to increase the savings of lower level (potentially harder to standardadize) functions because of organizational hierarchies (clinging to the past) and un-necessary but often fiercely defended complexities. 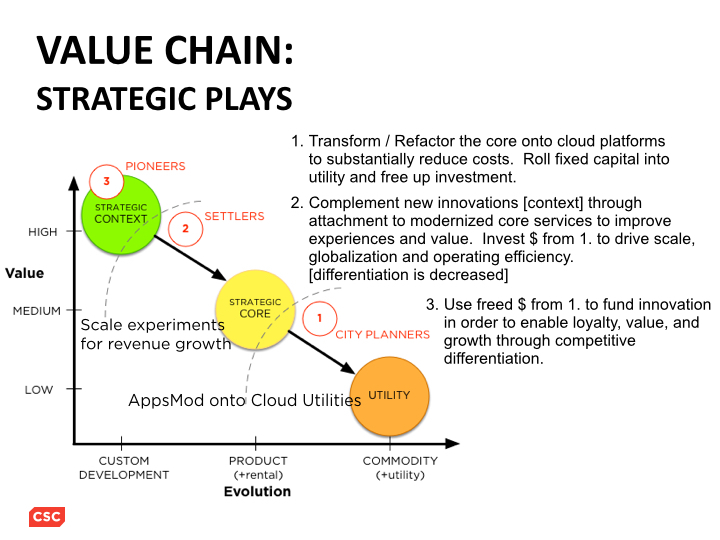 The really important strategic plays, that CSC has been bringing to it’s customers are really our ability to bring ecosystem innovation to every customer to help create growth, and to modernize applications onto governed cloud utilities to help to create the savings to invest in this innovation. The critical focal point for our enterprise customers should be the transformations across these different evolutionary stages . For a Systems Integrator like CSC, this natural value chain, that despite being different for every company, begins to reflect some very consistent transformation/integ ration opportunities. Suggesting that we can bring “High Value” services into the Strategic Core if we’re able to harvest innovation from one customer/vertical across to other clients. Or through Highly Evolved “as a Service” plays helping to bridge core IT with the broad network of our “as a Service” partners. The net is that CSC, as a global delivery partner, and augmented with the worlds best Strategic Partnerships, can help our clients map their own value domain, develop strategies for pioneers, settlers and city-planners alike. We can help establish a process for digital leadership and use our “Double Deep” skills to ensure that each client gets the business and technical benefit for their strategy. Most importantly, we can help you, our clients, align the value chain evolution investments for optimal business results. I really want to thank @swardley for his insightful work that I’m blatantly dumbing down and exploiting here.. for more please see: OSCON2014 or his blog here.